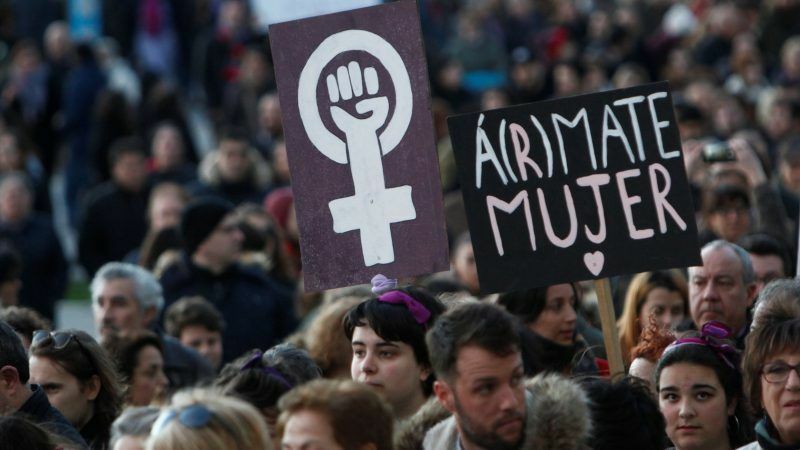 Spain marked International Women’s Day yesterday (8 March) with an unprecedented strike in defence of their rights that saw hundreds of trains cancelled and massive protests held in Madrid and Barcelona. Called by 10 unions to demand gender equality, particularly where salaries are concerned, the 24-hour strike dominated headlines with famous female presenters noticeably absent from radio or television shows. “This should be a starting point to change things. We are far from real equality,” Maria Angels Pina, a teacher in her 60s, told AFP at an evening march in Barcelona attended by around 200,000 people according to municipal police. In Madrid tens of thousands of people, many wearing purple or holding up purple balloons — a colour long associated with gender equality — marched along the central Gran Via boulevard, chanting and holding signs that read “Justice!” and “Revolution”. Smaller protests were held in dozens of cities across the country as women hung aprons on their balconies in a pre-arranged sign they were ditching domestic chores for the day. Feminist groups also called on women not to spend money, particularly on items such as deodorant whose versions created for women often cost more. Spain’s two main unions — the CCOO and UGT — were not part of the grouping that called the 24-hour strike but asked their members to stop work for just two hours on Thursday. They estimated that 5.9 million men and women had observed the short stoppage. The strike was attempting to emulate Iceland’s 1975 work shutdown, when women took a day off in October to demonstrate their vital contribution to the country’s economy and society. Pilar Lahoz, a 35-year-old office worker who carried a sign that read “Without us the world stops” at the protest in Madrid, said she has struggled to change jobs because potential employers rule her out when she says she is planning on having children. “While we have advanced a great deal there is still much to do,” she told AFP. The strike comes as countries around the world mobilised for #InternationalWomensDay, a worldwide trending topic on Twitter, and comes hot on the heels of #MeToo and #Timesup campaigns that went global with allegations of sexual misconduct in Hollywood. Belen Ramiro, 40, who wore stickers that read “feminist strike” on her jacket at the march in Madrid, said she did not cook or do any other housework as part of the strike and her daughter did not go to school. “We want to change the culture that it is women who are caretakers,” she told AFP. Countless sarcastic memes circulated on social media and mobile messaging apps, with one video showing a man desperately trying to start a vacuum cleaner, pulling at the retractable plug cable like he would power up a lawnmower. Spain is a leading country in the fight for women’s rights and against gender violence, even though much remains to be done. The groundbreaking legislation set up a hotline that would not appear on users’ phone bills, offered free legal aid and established special courts for victims. Women earn 14.9% less than men in Spain, slightly better than the EU average of 16.2 percent, according to the bloc’s statistics agency Eurostat. It was not yet clear how many Spaniards went on the 24-hour strike, but trains on the Madrid and Barcelona undergrounds were less frequent than usual. High-profile women politicians and business leaders also spoke out strongly against inequalities. Famous actresses such as Penelope Cruz and Rossy de Palma were also striking, with Cruz cancelling planned events and letting her partner Javier Bardem take care of their two children. Ana Botin, the head of Santander, Spain’s largest bank, tweeted that “the motherhood penalty is not a myth”. “After a first child, a women’s income drops sharply, and never fully recover,” she added. All these witches do they do is blame you, yell accusations and steal your money. Men should really stop having relationships with women. your taxes will only be used to raise illegitimate children that they didn’t have with you. and why don’t you march for Zineb el Rhazoui instead of against deodorant prices…you despicable ‘gimme gimme gimme’ ‘feminists’?